To say that Stork’s is a Wilton Manors landmark is an understatement. Now celebrating its 20th anniversary the bakery/café has been a popular meeting spot since Jim Stork opened it in 1997. Those who think of it as “just a coffee shop” couldn’t be more wrong. While it does serve eight different styles of brew, as well as an array of teas, smoothies, cappuccinos and lattes, iced or hot; folks can also grab a pastry to go along with their cup of Joe, or sit and enjoy a full breakfast, lunch or dinner. Although he’s no longer involved in the business, Stork’s still bears the name of its founder, who led quite a different life before he came to Wilton Manors. As Stork explains, “Prior to Stork's, I ran a small pharmaceutical company called Campbell Laboratories. After the sale of the company in 1996, I wasn't sure what my next career would be. The coffee trend was exploding and I watched the growth of Starbucks. At that time, there were no Starbucks in the Fort Lauderdale area. “More and more gay people were also moving into Wilton Manors and I wanted to capitalize on that growth. At the urging of friends, I started looking into opening a coffee house. We wanted to create an upscale place that could compete with the eventual arrival of Starbucks. 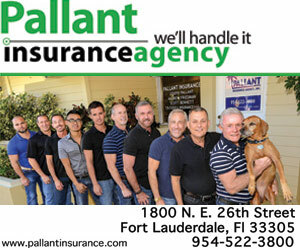 We also wanted to become an integral part of the growth of the community in Wilton Manors. To compete with Starbucks, we had to make everything from scratch. Founding chef Jerry Pond and Stork soon brought on Peter Dekaj, who had been a baker for Gran Forno, as Stork’s head baker and managing partner. “I was fortunate to have the workhorse in the kitchen,” says Stork. As locals flocked to the bakery/café, Stork became a popular figure in the growing LGBT community and, eventually, became the city’s second openly gay mayor. Stork explains his decision to run for office, “Stork’s was a big influencer to run for mayor. Many of the customers of Stork’s were residents of the city, and it gave me an opportunity to learn their ideas and concerns. It also led to me being involved in many civic organizations; these experiences integrated me deep into the fabric of the community. Ten years after opening the doors to Stork’s, he turned over ownership to his business partner Peter Dekaj. Stork now enjoys a quieter life with his husband Ronald Ansin. The snowbirds spend the summers in Massachusetts and are still active in Democratic politics and philanthropy, working behind the scenes for ACLU. Now Dekaj runs the company with the assistance of his head chef Rose Klein, while catering and marketing is overseen by John Emmet. Chef Klein tends to lean toward the Mediterranean, even though her own heritage is Eastern European. She learned to cook from her mother’s recipes and much of the fare still has that comforting home-cooked feel. John Emmet is a New York native with years of experience from a food service career that took him from running a catering company of his own to businesses in New York City and the Hamptons. He has been the driving force behind Stork’s successful entry to the catering business. It’s that connection to the community, along with high quality products and services that have allowed Stork’s to not only survive the onslaught of massive chains such as Starbucks and Panera, but to thrive in a community in which it has deep roots.